Top members of the Air India management are meeting in Mumbai on Wednesday in the backdrop of controversy surrounding some of the key appointments in the company recently, sources said. "A meeting of top management, including some Board members who are based in Mumbai, has been convened this evening. "It is likely to discuss some of the key appointments, which have come under question following independent directors objecting to them and meeting with the PMO officials over the issue," airline sources told PTI. However, independent directors on Air India Board, who are understood to have objected to some of these appointments, would not be attending this meeting, the sources said. 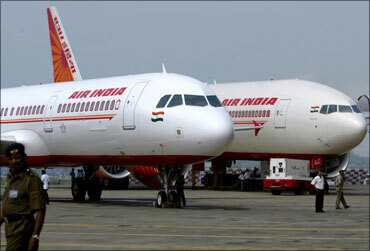 Air India recently made appointments to three key posts in the company, which include Capt Pavan Arora as chief operating officer for Air India Express, Stefan Sukumar as Chief Traning Officer and Kamaljit Rattan as Chief Information Officer, at high-pay packages. Wednesday's meeting comes ahead of a meeting Air India CMD Arvind Jadhav would have with Director General Civil Aviation SNA Zaidi in New Delhi on Saturday. The full Board of Air India is scheduled to meet on November 11, airline officials said, adding it was slated to take up issues relating to the airline's turnaround plan and the progress made in its implementation. The independent directors who met principal secretary in PMO T K A Nair were Vice Chairman and MD of Mahindra Group Anand Mahindra, former Chief of Air Staff Fali Homi Major, FICCI Secretary General Amit Mitra and Yusuffali M A, Managing Director of Dubai-based industrial house Emke Group. They had discussed the controversial appointments among other things. The controversy over Arora's appointment as Air India Express COO arose following reports that he had not qualified as the Flight Operations Instructor in DGCA as he reportedly did not fulfil the minimum requirements for the post. The issue came up only weeks before his appointment in Air India. There are also allegations that he was given the appointment letter even before the Board had approved it in September 27. Similarly, the selection of Stefan Sukumar as chief of training came under scrutiny as he was an instructor for Airbus A-300 and A-310 aircraft, both of which are not in Air India's fleet, dominated by Boeing B-777s and Airbus A-320s. DGCA rules state that an airline's training chief should be an approved examiner on the type of aircraft which is in the fleet and should be a permanent employee of the airline. In case the airline has a mixed fleet, the training in-charge should be a DGCA approved examiner on aircraft type of highest category in the fleet. However, the airline has maintained that DGCA regulations have not been violated as Sukumar would be reporting to the 'accountable manager' or the CEO as part of his duties. These appointments, the officials said, are also likely to be discussed by the Board on November 11.